Yesterday afternoon, I received a phone call from our prospective Liberal candidate in the upcoming provincial by-election. 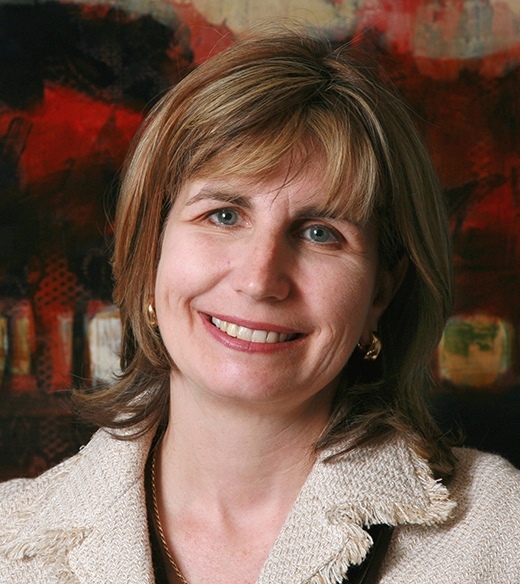 Although I voted Liberal in the past, I was never particularly fond of our previous MPP, Madeleine Meilleur. (It didn’t help that back when she was still city councillor, when I once wrote to her about an issue, she never even bothered to send back an acknowledgement. And this was back in the snail mail days.) So despite my vote, I am not what they call an enthusiastic supporter. All in all, Ms. Des Rosiers left me with a very good impression. I am glad that someone with her attitude and qualifications is running for office, and I hope she succeeds. 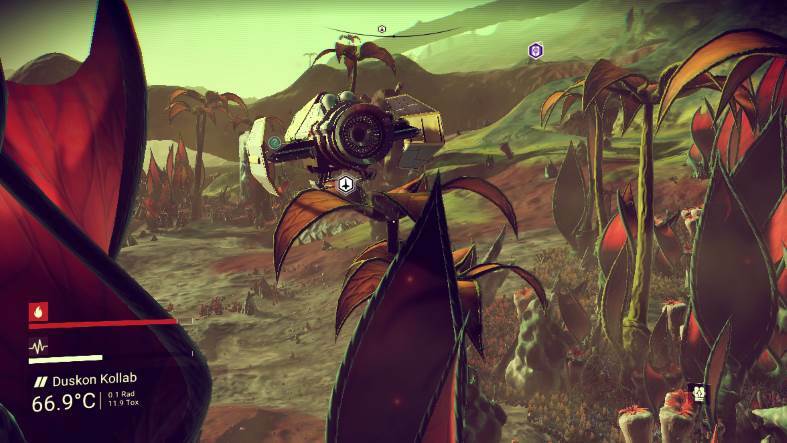 And the most maligned game of the year award for 2016 goes to… undoubtedly, No Man’s Sky. This game was much hyped by its creator in the months leading up to its release, hugely disappointing its fans when the released version lacked many of the features that they anticipated. I was not part of this lot, though. I have not even heard of No Man’s Sky until I was asked to review it by a customer. I spent a bit of time playing with it. I actually found the game quite enjoyable, albeit a bit monotonous after a while. Game play, in the end, boils down to landing on a planet, collecting resources, upgrading your ship, suit, or weapon, and moving on. There is a very thin storyline about some perpetual conflict between the three alien races that you meet, the mysterious “sentinels”, and the even more mysterious Atlas that ultimately reveals that the galaxy which you explore is just a simulation (d’oh!) but I found it uncompelling. Still, I found the game strangely attractive. Perhaps because it is the ultimate sandbox environment: You are not confined to a building, a cave, a city, a country, or even to a whole planet: you have an entire universe to explore! Still, I’d love to have seen more races, signs of civilization, alien cities covering entire continents… or for that matter, just continents and more variety in the landscape within a planet, differences between mountains and plains, polar and equatorial regions and the like. 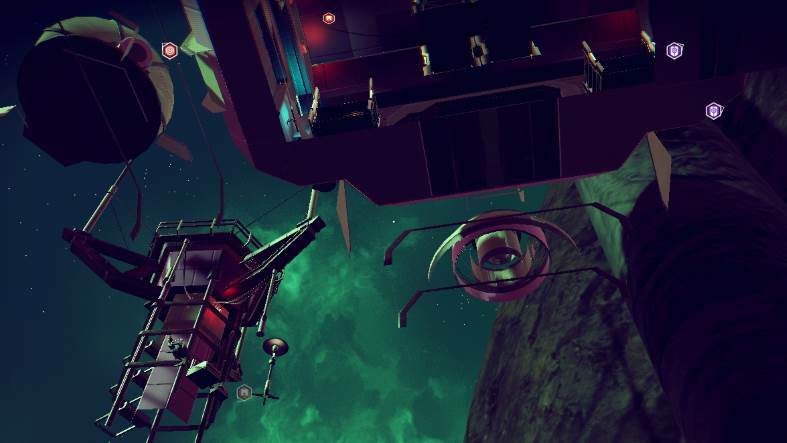 In short, I have to agree with those reviewers that No Man’s Sky feels a little unfinished; it would make an excellent indie game, but it is a bit of a letdown when it is released at a premium price under a major label (SONY). 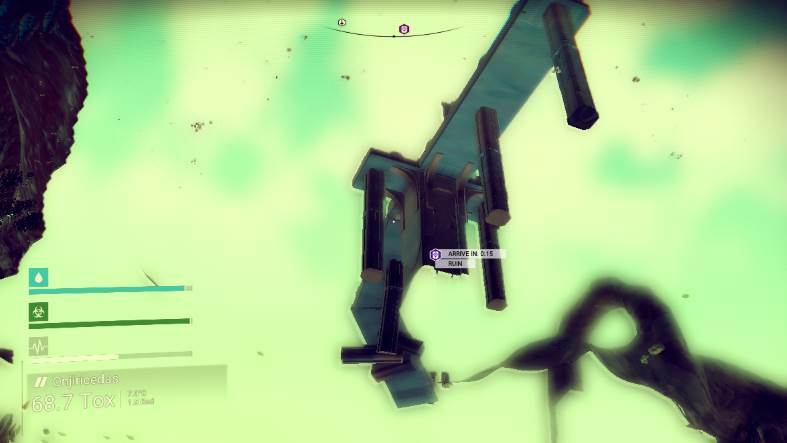 Like all other games, No Man’s Sky has its glitches. I certainly ran into a few of them. The most annoying is when the game slows down unexpectedly, for which the only remedy is to restart the game and reload the last save. Fortunately, the remaining glitches were much easier to overcome. Like, when I managed to land my spaceship on top of a freaking plant. 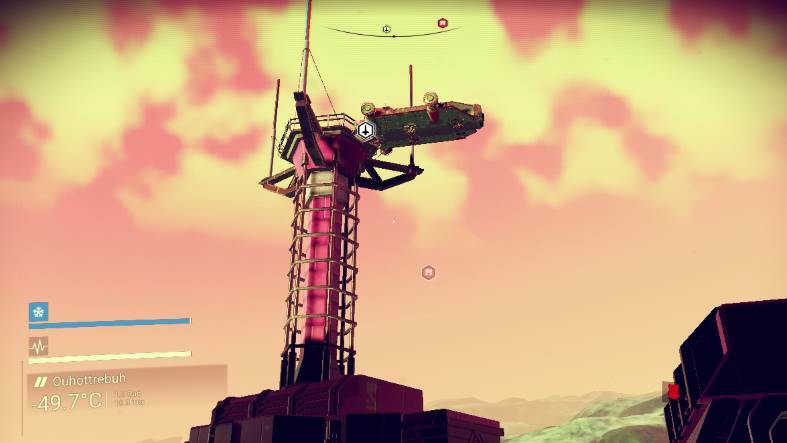 I also managed to land once on top of a tower, with my spaceship precariously balanced on one end, making it quite a challenge to get back on board. Or how about my starship, which I swear I previously left on the ground, ending up high, way high up in the sky? Thankfully, by this time I knew how to call my spaceship back. I once managed to fall out of the world. It is a bit disconcerting, but easy to solve by reloading my last save. And once I happened upon a building that was mostly floating in the air. As it turns out, building floors are transparent from below. 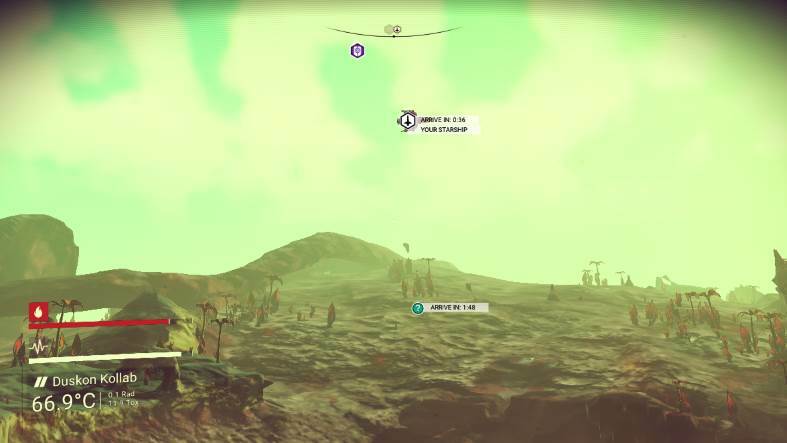 I was hoping to be able to enter areas that were previously inaccessible to me (I have not yet obtained the appropriate Atlas pass), but alas, the transparency did not go that far. Unfortunately I had to trade it away when a spaceship with a bigger cargo capacity became available. Maybe one day I’ll find another one like this, with more cargo space. 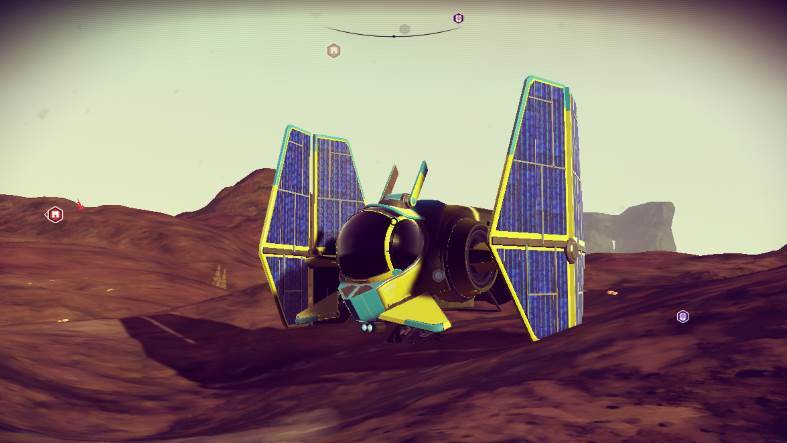 In the end, it seems to me that No Man’s Sky will not appeal to everyone, but to those who like it, it can be quite enjoyable with decent replay value. I still fire it up from time to time. It is almost the end of October, and I only added one blog entry so far this month. 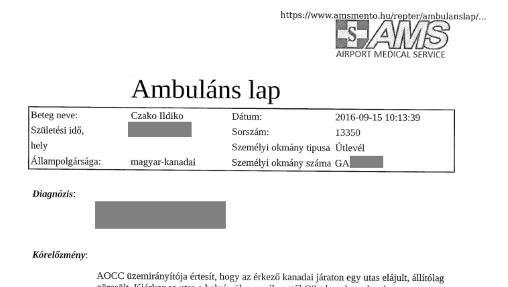 One reason is that we had a minor health scare: when my wife traveled to Hungary last month, she landed in a hospital on arrival, as she had an unexplained seizure during her flight. She is doing well, thankfully. She returned home safely, with no lasting effects. There will still be a few more tests to be sure, but the scare is largely over. This unfortunate incident, however, allowed us to experience first-hand the state of the health care system in Hungary, about which we read so much in recent years. Yes, as it is well known, the system is badly underfunded: salaries are miserably low, and sometimes, even basic supplies are lacking. But we cannot utter a bad word about the health care professionals that my wife encountered. They were impeccably professional and helpful, going out of their way to assist us, even beyond the call of duty. When my wife’s cell phone was acting up, one nurse volunteered to help fix it with my assistance. When I explained to a doctor that I cannot visit her in person because I happen to be a continent away, he handed the phone to my wife, allowing us to have a conversation (finally!) using a hospital line for a few minutes. They helped with insurance matters, too, and they issued a very thorough discharge report, complete with a CD-ROM containing the results of a CT scan. All in all, we have nothing but praise for these overworked and underpaid health care workers, some minor mishaps notwithstanding. They were kind, they were helpful, and every one of them that I spoke with was ready to assist, forthcoming, and flawlessly polite. Thank you for your kind care. Köszönjük szépen. Watching the American election campaign is like watching not one but a whole series of train wrecks unfold. There’s nothing you can do about it, and there is a good chance you’ll be hit by flying shrapnel… but at least until then, why not enjoy the bizarre spectacle. Like Mr. Trump describing his admission of regularly committing sexual assault as “locker room talk”. It made me soul-search a little. 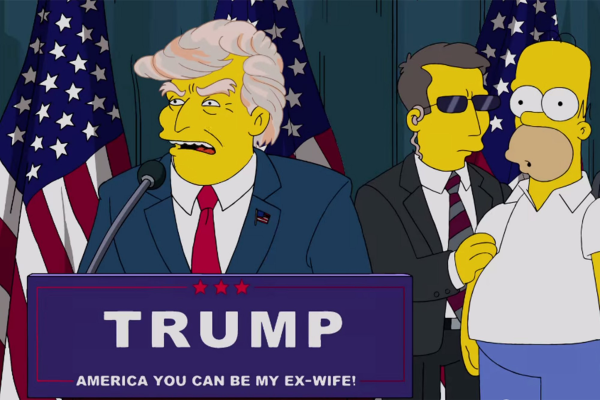 Am I being a hypocrite, denouncing Trump? After all, I was a young male once… and I spent some time growing up in a small town in Hungary, surrounded by boys my age for whom crudeness was the norm. Sure, we engaged in “locker room talk”. We talked about girls. We even talked about their lady parts and what we’d like to do with those. We discussed our sexual fantasies, and we bragged about things that we never actually did. But I do not recall anyone ever bragging about committing sexual assault. However crude was the language, however much it treated women as mere sexual objects, violence against women was not part of our “locker room talk”. And that was, well, some 40 years ago. I was in my early teens. 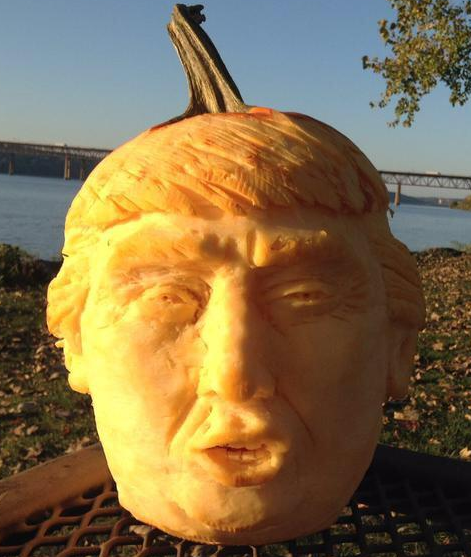 Not in may late 50s, and certainly not as a business and community leader, reality TV star, aspiring one day to become president of the United States, and by extension, leader of the free world. No, Mr. Trump, this is not “locker room talk”. Nor do we have any real reason to believe that what you bragged about was not true. At best, you were bragging about committing sexual assault that you only dreamed of doing; more likely, you made an admission of committing a violent crime. I have heard women defend Mr. Trump by suggesting that this is normal for men. No, it is not. Crude discussions about females and parts of their anatomy may be, but no, talking about committing sexual assault is not normal for men. I also heard women defend Mr. Trump by suggesting that all this is normal in the world of Fifty Shades of Gray. Well, that’s another reason for me not to read that book. But whatever the reasons, it is a disgrace. Some Republican politicians are waking up (no doubt worried about their own re-election changes.) But when will Republicans collectively wake up, declare that enough is enough, and return to the land of sanity? If for no other reason, it’s because (judging by his deeds, if not by his words) Mr. Trump is much further away from the pro-life, socially conservative views of most conservatives than even his opponent, Mrs. Clinton. As for those of us outside the United States, I just hope we get a “leader of the free world” who is not stark raving mad and unhinged.